Tepe Yahya provides a stratigraphic sequence that stretches some 6,000 years, from the Neolithic period to the early centuries AD. As a result, the site is critical for understanding cultural processes in southeastern Iran. 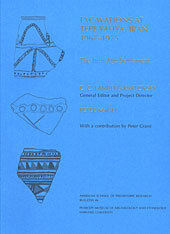 In this fifth volume of results of the excavations at Tepe Yahya, Peter Magee presents evidence from the Iron Age occupation of the site. Looking beyond the epigraphic and historical data and examining the insights provided by the artifactual record, Magee describes how a small settlement, located some distance from the main centers of power, came into being and was affected by the emergence of the Achaemenid imperial system, which stretched from Pakistan to Libya.